Solterra Resort - Orlando Vacation Rental Homes. 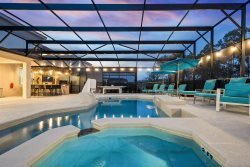 Family Vacation Rentals Close to Disney in Davenport, Central Florida. Fantastic resort amenities, kids will love the lazy river, parents will love relaxing in the hot tub. Enjoy food and drink from the poolside cafe. What more could you want! Choose from 5 and 6 bedroom homes alway the up to large luxury 14 bedrooms villas. Solterra offers the perfect balance of amazing value and great quality homes. Located just minutes from Orlando's theme parks, shopping, dining and other area attractions. Solterra resort is just a 5 minute (2.5 mile drive) from a Publix supermarket and other stores. There is also an Imax movie theater and many other stores such as Target located at Posner Park, just a 7 minute (4.2 mile drive) away. Enjoy unlimited access to all the resort has plenty to offer with a state of the art clubhouse, resort pool, hot tub, well-equipped fitness room, lazy river, tennis and volleyball courts, children's playground and recreational area. There is also a poolside cafe when you enjoy food and drinks such as frozen cocktails! Solterra Sol | 5 Bed Town Home in Solterra Resort with Splash Pool!